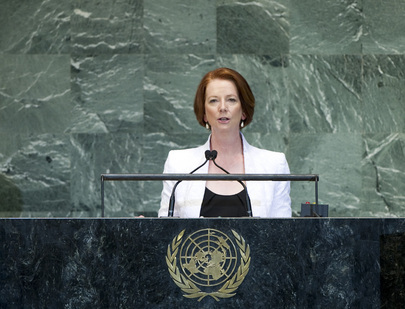 JULIA GILLARD, Prime Minister of Australia, said that, as seen in the seven decades of the United Nations, the international community could do together what it could not do alone. The Organization not only articulated the highest ideals, it made practical progress, as seen in the Millennium Development Goals. The global economy had grown, and the world’s population living in extreme poverty had been halved, and the number of children who did not attend school reduced by a third. But, because there were still areas where the international community had failed to achieve change, she had accepted the co-chair, with Rwanda, of the Millennium Development Goals Advocacy Group. Where the world had fallen short, the response “must be action, not disillusion”. She went on to say that on a national and regional level, Australia had doubled its development spending on education in the past five years. Further, Australia would join its Pacific Island Forum partners in the unprecedented gender initiative, “Pacific Women Shaping Pacific Development”, contributing $320 million over 10 years to support women’s political participation, expand women’s leadership and to spread economic and social opportunities in the region. The empowerment of women and girls was a principle underpinning every Australian aid intervention and initiative. “2015 is a goal, but it is not a destination,” she said. Looking at it as a point of departure, her country was committed to the Post-2015 Development Agenda. Taking lessons learned since 2000 towards that end, she stated that peace was an essential foundation to development and to the progress of societies recovering from conflict. Thus, peacekeepers needed to also be peacebuilders by enabling development. Poverty alleviation could not occur without job creation and wealth. Further, environmental protection and human development were not conflicting global goals, as climate change threatened secure food supplies which guaranteed development. And new clean sources of energy could deliver a new source of economic growth. Continuing, she said that her country was one of the most successful multicultural and multi-faith nations. As such, she underscored that there was nothing “natural or inevitable” about violent conflict over religious belief and “we must reaffirm that here today”. Denigration of religious beliefs was never acceptable. However, “our tolerance must never extend to tolerating religious hatred and incitements to violence”. The perpetrators of all such violence must be brought to justice and all such incitement must be condemned. Turning to security issues, she said her country adhered to all Security Council resolutions aimed at curtailing weapon proliferation activities, such as those of the Democratic People’s Republic of Korea. Australia also had a leading role in the United Nations mandated mission in Timor-Leste and was one of the largest non-North Atlantic Treaty Organization (NATO) contributors to the United Nations Assistance Mission in Afghanistan (UNAMA). In October, it would be a candidate for Security Council membership. On the crisis in Syria, she noted her country’s contribution to humanitarian aid, and called for the international community to do “everything we can to end the suffering of the Syrian people”. In that regard, she urged that the world unite behind the efforts of Lakhdar Brahimi, the Joint Special Representative for Syria, and for members of the Security Council to act decisively. She then pointed out that six years after the Security Council first addressed Iran’s nuclear programme, Iran still refused to assure the world its nuclear programme was peaceful. It was crucial that a strong message, through the Security Council, be sent to Iran to change its behaviour immediately, especially in light of its recent comments about Israel. There was still opportunity for diplomacy, backed up by robust sanctions, to persuade Iran to change its course. Also, the impasse in the Middle East needed to change. In that regard, she called for direct negotiations to be resumed towards both the establishment of an independent and viable Palestinian State and Israel’s right to exist in security and peace. “Both sides need to make compromises” and sacrifices, she stated. Concluding, she said that as a country of the Asia-Pacific region, with neighbours who were developing countries, Australia had a perspective of both the North and South. From the beginning of the United Nations, her country had demonstrated not only its commitment to the high ideals of the Organization, but it took practical approaches to achieving change.